​Jose Holebas' late strike cancelled out Manolo Gabbiadina's first half goal as Southampton and Watford played out a controversial 1-1 draw at St. Mary's Stadium. It was Watford who almost had the perfect start to the game on a wet and windy afternoon, when Gerard Deulofeu was played through inside the first five minutes – but the winger could only fire straight at an onrushing Alex McCarthy with a rather tame side-footed effort. After a sluggish start from the hosts, Southampton grew into the game and took the lead after 20 minutes, as Roberto Pereyra failed to clear Ryan Bertrand's corner, allowing Danny Ings to steal possession and find Manolo Gabbiadini, who slotted home from close range. Watford were then aggrieved that they weren't awarded a penalty just shy of the hour mark for Bertrand's rash challenge on Nathaniel Chalobah, with Pereyra denied by McCarthy on the follow-up as the visitors pressed for an equaliser. The Saints thought they'd doubled their lead in the 66th minute through Charlie Austin, however the goal was eventually disallowed as officials ruled that Maya Yoshida, who was in a offside position, had interfered with the ball – although replays suggested the call was harsh. Watford made the most of the decision and equalised with eight minutes remaining, Jose Holebas' strike from the edge of the area taking a deflection off Cedric to loop over the despairing dive of McCarthy, who almost gifted the Hornets all three points with a punch that looped onto the bar three minutes later. Mark Hughes will certainly be angered by the decision to disallow a legitimate goal from Charlie Austin, but the defending for Watford's equaliser will perhaps irk him even more. Jose Holebas was afforded too much space on the edge of the area, although the ball should never have found the left-back, as the Saints had a number of opportunities to clear, while Cedric's tame block hindered Alex McCarthy's efforts to save the shot. There were certainly improvements going forward for the home side, but defensive deficiencies were prominent once again. Starting XI: McCarthy (8*); Cedric (6), Yoshida (7), Hoedt (6), Bertrand (6); Lemina (7), Hojbjerg (5); Gabbiadini (7), Armstrong (6), Redmond (6); Ings (6). Substitutes: Austin (6), Ward-Prowse (6), Obafemi (N/A). He dealt with most things competently, taking no chances with the wet conditions and palming shots away with great distance, while making himself big when he needed to. Pierre-Emile Hojbjerg had a poor afternoon in midfield, failing to get into the game while his defensive cover in front of the back four left a lot to be desired. That was typified in the first half as he simply watched a Watford counter attack after being dispossessed. Watford themselves could feel hard done by after being denied a certain penalty in the second half, however Javi Gracia will be concerned by some of their defending from set pieces. Southampton's goal came as Roberto Pereyra failed to clear a flicked on corner, before being robbed of possession and being punished by Manolo Gabbiadini, just seconds after Wesley Hoedt almost headed the hosts into the lead from an earlier corner. The Hornets would take solace from their attacking fightback, especially in the second half, although will need to tighten up defensively, namely from corners and wide free kicks. Starting XI: Foster (6); Femenia (5), Mariappa (6), Cathcart (6), Holebas (7); Hughes (5), Doucoure (6), Chalobah (5), Pereyra (5); Deulofeu (5), Success (6). Substitutes: Deeney (7*), Gray (6). 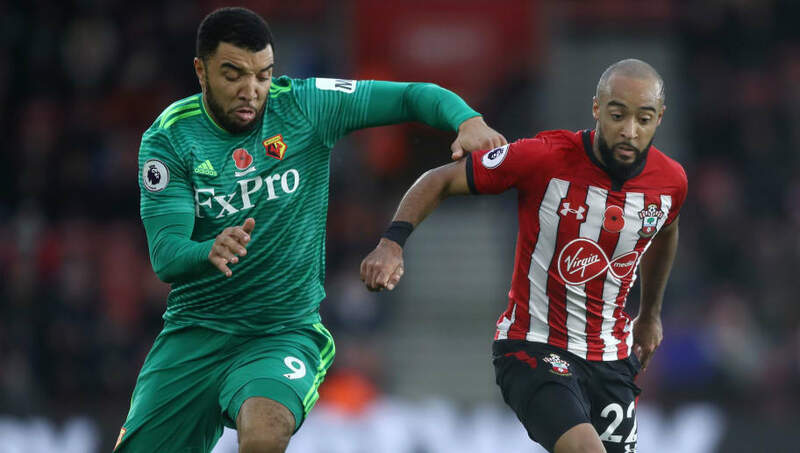 Troy Deeney came on as a 40th minute substitute with Watford a goal down, and gave his side a focal point in the attacking third that helped them back into the game. He held the ball up well when it was played up to him, while he made his presence felt with countless headers at the near post when defending set pieces, before playing a significant part in Holebas' equaliser, playing the initial ball across goal which eventually found the Greek international. Without Etienne Capoue in midfield, Nathaniel Chalobah deputised, but couldn't offer the same level of performance that the Frenchman does. Often mistiming his challenges or misplacing his pass, the England international will be looking to learn from what was a difficult afternoon on the south coast. Frustrating afternoon, take a point on the road but can't help but feel that's an opportunity missed. Plenty of misplaced passes, Chalobah looked tentative in midfield. Mariappa, Doucouré and Deeney pick of the bunch today. Some poor performances elsewhere, in particular Deulofeu and Chalobah. After the upcoming international break, Southampton travel to London to face Fulham at Craven Cottage on November 24. As for Watford, they host Liverpool at Vicarage Road, also on November 24, in a game that finished as an entertaining 3-3 draw last season.